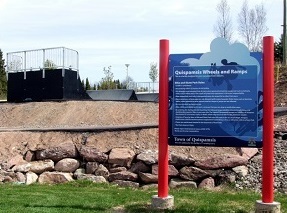 Skateboarders can hit up the jumps at the Skateboard Park (11 Landing Court) located behind the Kennebecasis Valley Library near the Arts and Culture Park. The land has a natural slope that was built into the park’s landscape, and a variety of ramps and pipes to keep any beginner or seasoned enthusiast active! There is no charge to use the park, which is open daily until 10 pm. Click the link to view our live feed.